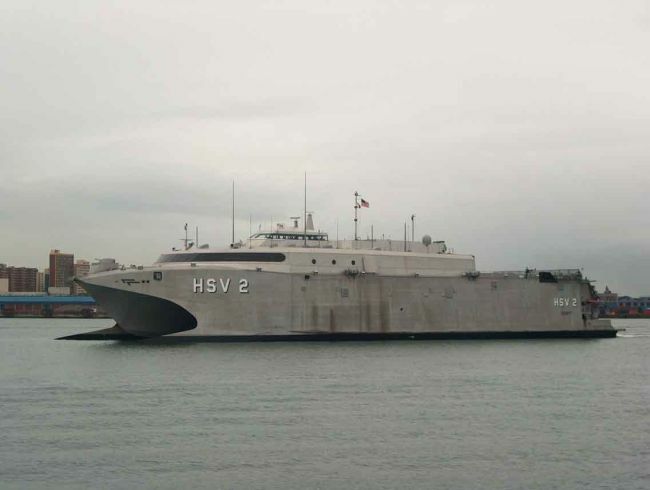 The US Navy High Speed Vessel 2 SWIFT is involved with an initiative off West Africa in support of the National Oceanic and Atmospheric Administration's (NOAA) oceans and climate research and data collection. Swift is part of the US Navy’s Africa Partnership Station currently deployed off West Africa – the other vessel being the amphibious dock landing ship USS FORT McHENRY (LSD 43). USN Fort McHenry is on a seven month deployment to West and Central African waters participating in a policy of helping enhance regional and maritime safety and security in the region. This is being achieved through the development of partnerships and the building of relationships with the respective countries in the region. Swift began the NOAA operation on 18 January when the first of five drifting buoys were placed at sea while the ship was in transit from Rota in Spain to Dakar. As their name suggests, the buoys drift with the ocean currents while collecting data such as sea surface temperature, which is transmitted via satellite and distributed to meteorological services and researchers worldwide. Crew on the Swift underwent training with NOAA prior to the ship’s deployment on 4 January to join the African Partnership Station. The vessel will drop about 80 buoys during her current deployment to West and Central Africa. Each drifting buoy consists of a surface float and a 15 metre drogue (sea anchor) attached by a thin tether. Begun in 1988 the programme has since been extended worldwide and reached the South Atlantic in 2004. Drifters can remain at sea transmitting data for years, helping improve weather forecasting including long term forecasts of droughts and floods.